The U.S. Navy is on schedule to declare initial operating capability for its F-35 Joint Strike Fighters in February, with no recent delays experienced, Military.com reported Friday. Strike Fighter Squadron 147, the branch's first operational F-35 force, recently completed a milestone on USS Carl Vinson, contributing to the anticipated IOC of the aircraft. 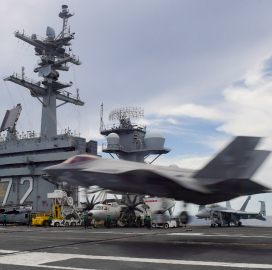 Lt. Lauren Chatmas, a U.S. Navy spokesperson, told Military.com that the Joint Strike Fighter Fleet Integration Office expects to reach other milestones according to plan. The squadron is scheduled to enter deployment on the same carrier in 2021, the report noted. The Navy now intends to transfer its F-35 operations from Eglin Air Force Base, Fla., to Naval Air Station Lemoore, Calif.